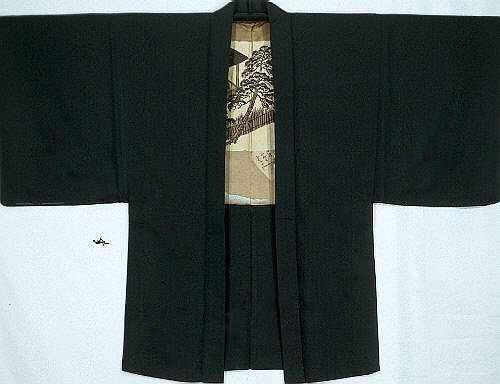 This is an outstanding example of the highest quality, Informal Man’s topcoat or “Haori.” It is black on the outer layer of the garment and has been specially hand woven in textured (“Hina Ori”) Silk, fully reversible, and has been sewn completely by hand both inside and out. 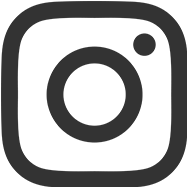 The outer Silk is a hard-edged, dense weave that appears shiny in changing light. Both layers are in excellent condition, and date from before the turn of the century. 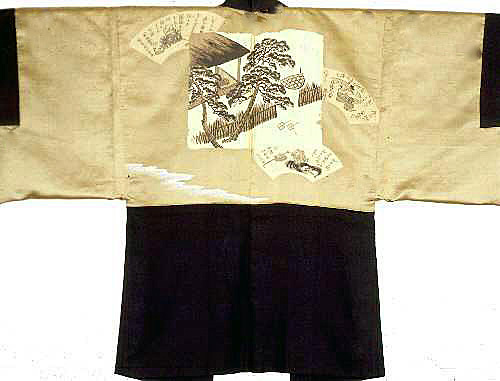 This garment represents the height of informal wear for Japanese men and was obviously specially ordered for a rich and high ranking Samurai, or merchant, as the center back Crest (“Mon”) is not painted on the original Silk but is woven in the piece itself. 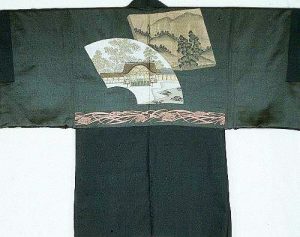 The only indication that this was a garment that the individual would have worn at home or at informal occasions is the appearance of one, rather than three or five, crests on the outside of the garment. 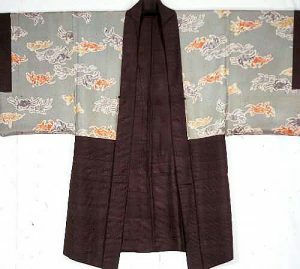 What makes the Haori for men so intriguing is the fact that the main source of decoration is on the inside of the back panel or lining. 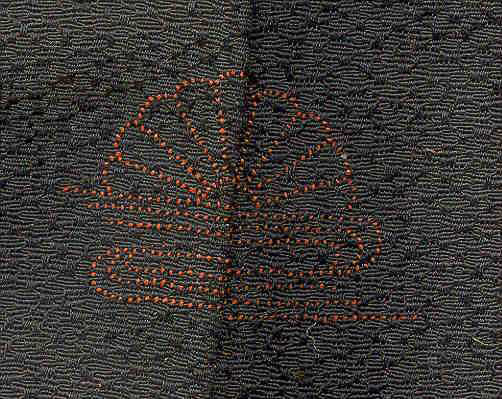 It is this lining that determines the status of the man wearing the garment. The more intricate the Silk weaving, especially with the inclusion of the written language, the wealthier the individual who commissioned it. 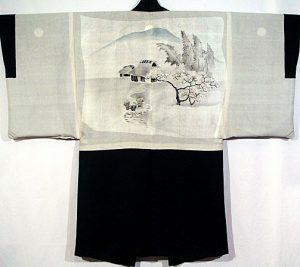 The inner back panel of this dramatic Haori has been woven in an intricate, and dramatic scene dominated by the large central Pine or “Matsu” which symbolized long life. The Moon in the background has been woven in pure white gold threads. 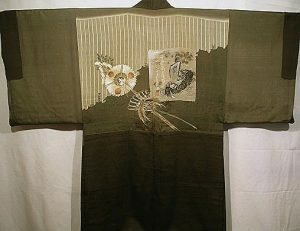 Surrounding the central motif are 3 fan insets with elaborate designs that include Kanji characters. This magnificent weaving would have taken a Master Artisan much time and skill to complete. 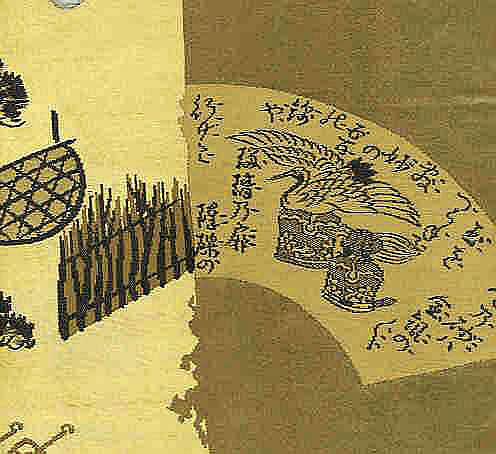 The family crest or “Mon” is based on the Chrysanthemum (“Kiku”). Because of its ascribed nobility and purity, it was known as one of the “4 princes” among subjects of art. 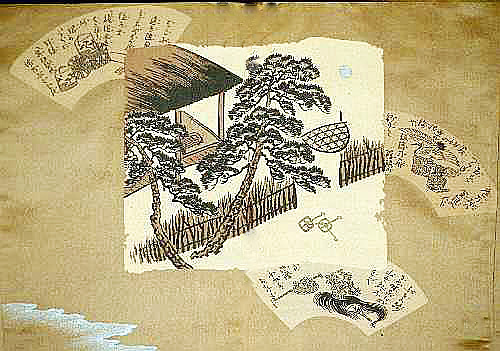 It was also known as the “longevity plant” (reinforcing the theme of the inner weaving) as it was associated with Kusunoki Masashige, the emperor Godaigo’s masterful General. By the 13th century, the Chrysanthemum was associated with the Imperial Line and is still considered the Crest of the Royal Family.